Are you benchmarking your health plan correctly? If you are using data from your carrier or a small study of only large employers, chances are you are not effectively analyzing your rates. To truly benchmark your plan, you need to compare your plan to others in your state, industry, and size category. That’s the best way to truly know if you are getting the best rates or should negotiate more. This type of granular benchmarking can also help with your workforce communication strategy. If you know your plan is better than most in your state or industry, you’ll have powerful talking points when delivering benefit information sessions. Let’s take a look at how the UBA Health Plan Survey is used to do this kind of tailored benchmarking. Consider a design firm in Georgia that offers a consumer-directed health plan (CDHP). Its premium cost for single coverage is $441 per month. Compare this with the benchmarks for all plans (see diagram) and you can see that it is $68 per month less than the national average. 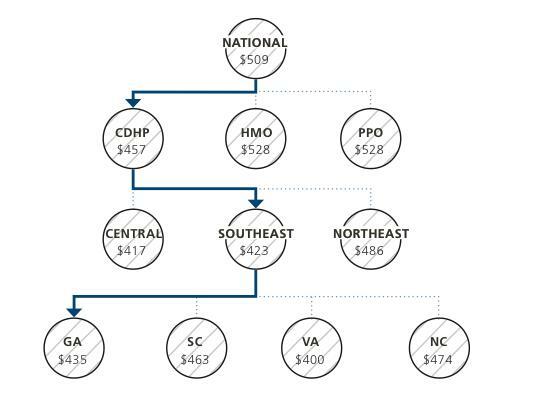 When compared with other CDHPs in the Southeast region, this employer’s cost is actually $18 per month more expensive than the average. This employer’s cost appears to be higher or lower compared with national and regional benchmarks, depending on which benchmark is used. Yet this employer’s cost is actually higher than its closest peers’ costs when using the state-specific benchmark, which in Georgia is $435. Bottom line, this employer’s monthly single premium is actually $6 more than its competitors in the state. This kind of data can really help employers when they are at the negotiating table or when designing benefits to attract and retain talent. Are company premiums above or below the norm? Are the levels of contributions you require your employees to pay in line with your competitors? Are co-pays, deductibles, coinsurance, and out-of-pocket maximums for your plans in line with averages for your geography, industry, and size? How do your annual premium increases compare with other employers in your area? How do your prescription drug benefits compare? Are you in step with the cost-containment strategies being implemented successfully by other companies in your industry? Request a custom benchmark report from your local UBA Partner. This free resource was one of our top 8 most popular resources for employers!